A good night’s sleep makes a lot of difference in your day today life. From keeping you fresh and energetic to shooing away your stress and anxiety, sleep plays a vital role in your life. But do you know that to get that block of good slumber you need to have a good mattress in place? Along with other factors such as your lifestyle, diet, stress, and temperature, the mattress you sleep on also brings in considerable changes in your sleep. So, which mattress is the right one? Here are a few tips that you could follow to choose from that dizzying array of mattresses available in the market. This is the basic requirement that needs to be taken care of. You need to find a mattress that ensures that the natural curvature of the spine in maintained. Only when the curve is balanced, your body will be aligned in a neutral way. The mattress should neither be too firm or too soft. An extra hard mattress will exert unwanted pressure on the acupressure points, throwing out your alignment. And, if the mattress is too soft, your pressure points will crave for support. The result – your body flops. Both the conditions will lead to an achy you! Everything has a lifespan; so does your mattress. And, according to leading orthopedics, the average lifespan of a mattress is 8 years. The materials used for manufacturing the mattress start degrading after about 7 years, slowly evading you of the comfort level it once used to offer. So, if you do not want to wake up in pain daily, try changing it before you start grunting. While it has been mentioned that a mattress should neither be too hard or too soft, the comfort zone could vary. There are people who prefer an ultra soft mattress. And if you are to follow the experts, you have to zero on your comfort level. Ultimately, it is you who is going to sleep. You could try sleeping on the mattress before buying one. There are numerous shops and boutiques that now allow the prospective customers to take a 20 minute nap in their sleeping position before reaching a conclusion. 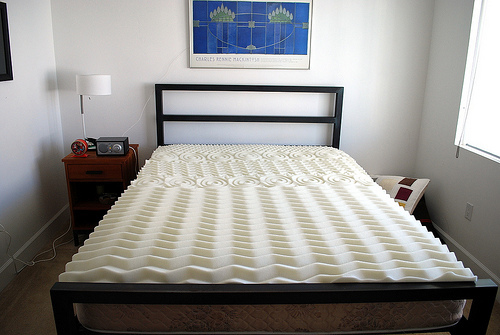 A saggy mattress upsets the curvature of the spine, in the process inviting pain and discomfort. While studies suggest that a firm mattress is a must if you have a bad back already, sagging is not advised even if your back is strong. Brand names are mere eyewashes. So do not be lured by the name of a particular brand or just because they are giving you some cool discounts. At the end of the day, all these mattresses are made by the same people. And that is why costlier is not so cool always. Opt for a mattress that is neither too thick nor too thin. A thicker mattress might not be your cup of tea if you have severe back ache or a troubling neck. Thicker mattresses are also not meant for shorter people or if your cot is quite tall. There are mattresses that come with adjustable levels of firmness. Opt for such mattresses, especially if you share your bed. This would ensure that you are not compromising on your comfort zone while the alignment of your spine is also intact. Now that you have finalized your mattress, the last thing you need to check is that whether the company offers you return policy. There are numerous brands that offer to take back your old mattress, but at a discounted rate. This return policy will ensure that you would not have to use the expensive mattress even if you are uncomfortable with the same. Should you choose a mattress that suits your cot or you? Well, the second one! The fitting should be taken care of but the best mattress will be the one that is bound to gift you a good night’s sleep.